Although you can often get away with throwing “dry clean only” clothing into the washing machine, using the wrong cleaning method for some garments can leave you with a sweater three sizes too small (or, in extreme cases, a dryer full of sweater confetti). Moral of the story? There’s usually a right way — and a wrong way — to clean something. When it comes to cleaning up bad credit, choosing the wrong methods may do more damage than good, leaving your credit in tatters. We’ve put together a guide to help you determine the best way to clean up bad credit, quickly, without ruining your credit score in the process. As you might expect, the very first place to start cleaning up bad credit is your credit reports. You have three main consumer credit reports, one each from the three major credit bureaus: Equifax, Experian, and TransUnion. By law, you are entitled to a free copy of each credit report once per year, which can be obtained through AnnualCreditReport.com. Or, you can get year-round tracking through the bureaus or a third-party service. Your credit scores (and general creditworthiness) will be determined by creditors based on the information in your credit reports, so you should check them regularly to ensure they are accurate and up to date. If you have bad credit, the source of that bad credit will be on your credit reports. The degree to which each type of item or account impacts your credit score and creditworthiness will vary. For example, hard inquiries do less credit damage than high utilization, which typically causes less of a problem than a missed payment. Indeed, your payment history is the biggest factor in your credit score calculation, so any item that suggests a failure to pay your debts — missed payments, foreclosure, bankruptcy — will tend to have the largest impact on your credit. Once you know where the problems lie, you can develop a plan to tackle them individually. This may include catching up past-due accounts, removing a reporting error, or simply waiting for an old mistake to fall off your reports. Before you work on cleaning up your negative items, you first need to ensure that everything on your credit reports is accurate and current. This means checking everything from your name and address to your open (and closed) accounts. Make sure your information is correct and that you recognize each account. 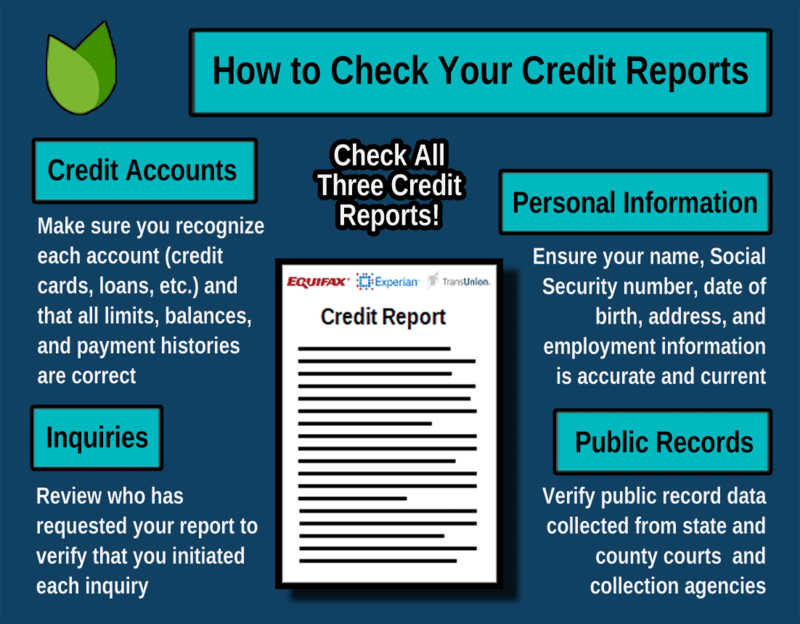 If you find problems with your report, such as a debt that doesn’t belong to you, you can file a credit dispute with the credit bureaus to have the erroneous or unsubstantiated account removed. The process, often called credit repair, can be done on your own online through the bureau’s website. Many consumers have also found success hiring a professional credit repair company, like those below, to act on their behalf. Hiring a professional can be particularly helpful if you have many items to dispute. Addressing errors in a timely manner can be especially important if you find any accounts that you don’t remember opening, addresses you don’t recognize, or any other signs of fraud or identity theft. But spelling errors and misreported numbers should be addressed right away, too. For example, your creditors typically report your account balances to the bureaus each month. If a creditor reports a higher balance than you actually have, your credit score could drop thanks to an inflated utilization rate. Unsubstantiated accounts can also be addressed through credit repair. In general, these are accounts that the creditor or collection agency may not have the right to collect due to a lack of substantiating documentation. If the collecting party can’t prove you owe the debt, you can often have the debt removed from your reports by disputing the account. Of course, if the other party can document your responsibility for the debt, credit repair can’t remove it from your reports. After cleaning up any errors or other disputable items through credit repair, it’s time to get down to the real work by addressing each remaining negative account individually. In many cases, this will likely involve dealing with an outstanding debt or high balances and utilization. One way to help get a handle on your debt is to consolidate it with a personal installment loan. Consolidation can help you organize multiple debts into a single loan, ideally one with a lower interest rate than you’re currently paying on your debts. Online lending networks, like those below, are an easy way to connect with multiple lenders to find the right fit. Any outstanding debt should get your immediate attention. If you can’t afford to catch up, a personal loan can help you pay off (or, in the case of a large debt, pay down) an outstanding debt and bring it current. You should also contact your creditor directly to see if you can work out an affordable payment plan. Next comes the high-interest debt. Paying this debt down will not only help your utilization and debt-to-income ratios, but can also help you save money by reducing the overall amount of interest you’re paying. This frees up funds to pay down other debts, which can help you get debt-free even faster. You should also aim to pay off any accounts that are in collections. While paying off a debt owned by a collection agency won’t erase the credit damage caused by defaulting on the debt in the first place, a paid collection always looks better to a future creditor than an unpaid debt. The only exclusion here is if your debt is (very) close to the statute of limitations for that type of account in your state. In this case, making a payment to the collection agency can reset the clock on the debt, so you may want to consider your options before contacting the collection agency. Once you’ve removed the inaccuracies, gotten current on your debts, and consolidated what you can, all the low-hanging fruit has been harvested. From here, time is your best friend when it comes to cleaning up your credit, starting with building — or rebuilding — a recent positive payment history. Your payment history is by far the most important aspect of your credit, and it can be worth up to 35% of your FICO credit score. Given that scoring models put much more weight on your recent history than what happened years ago, you can ease a lot of the mess simply by staying on track now and in the near future. With a low score, your options for new credit won’t be great, but a low-limit credit card can be a good start. If you prefer an unsecured credit card, be prepared to pay an annual fee and, likely, some sort of processing fee. If you can muster the deposit, a secured credit card can be a better option. In general, creditors like to see at least six months of positive payment history — but a year or more is ideal. This shows that your credit mistakes are in the past and that you’re making real strides toward a better financial future. First, set up your credit card to automatically pay a small monthly bill, such as a streaming service or your mobile phone. Don’t use the card for anything else; in fact, consider leaving it in a safe or a locked drawer — out of sight is out of mind. Then, go through your bank account to set automatic payments for that credit card, ideally for right after the regular charge hits your card (but definitely at least several days before your due date each month). With autopay, your bank will automatically pay your credit card each month on the date you select. Since it’s automatic, this will ensure you don’t make a late payment or, worse, miss a payment altogether. After six months or so of regular use, you should see your credit score improve a bit. When your score has improved enough to qualify for a better card — perhaps one without an annual fee, or a card with rewards — upgrade your card and repeat the process to continue building a positive payment history. At this point, the negative items that remain on your credit report should be legitimate and accurate — and stubborn. The only way to get rid of these negative items and accounts will typically be to outwait them, a process that takes between two and 10 years, depending on the type of item. Hard credit inquiries, for example, are the most short-lived negative items, and they typically only last two years on your credit report before they age off. Most other negatives will remain on your credit report for up to seven years, while certain bankruptcy discharges can hang out for a full decade. While 10 years can be a long time — even two years can feel like forever if you’re dealing with bad credit — it most likely won’t take the full time for the impact of the negative item to decrease. That’s because credit scoring algorithms (and the companies that use them) place more emphasis on recent activity, and less on older activity. So, a late payment from five years ago will impact your credit score much less than a late payment from last year, and a late payment from last month will have the biggest impact of all. The longer you can go without adding any new negative items to your credit reports, the cleaner your credit report will become. Eventually, if you maintain good credit behaviors, all of your negative items should age off your reports entirely, leaving you with squeaky-clean credit. As anyone who has ever lost weight on a diet can likely attest, it’s one thing to get rid of the weight — it’s another thing entirely to keep it off. The same thing applies to debt and bad credit; you can’t clean up your credit simply to then ignore it again. 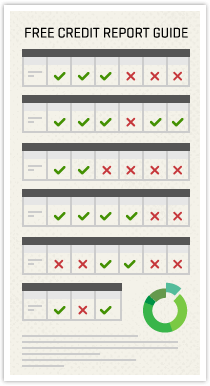 Instead, set up a regular schedule to track your credit scores and check your credit reports. Use your annual free credit reports to ensure your credit reports remain clear of errors, inaccuracies, or fraudulent accounts. Keep in mind that your free credit reports don’t typically include your credit scores. On the plus side, most credit cards will provide free monthly or quarterly credit scores, as do a number of free third-party services. Many credit monitoring services that offer more extensive services can also be found. In addition to a full range of credit-building services, including credit score tracking and credit report alerts, many paid monitoring companies will offer identity protection benefits like Social Security number monitoring. The pricing will vary based on the services you need, so shop around for a good fit. In many ways, your credit is similar to living with white carpet: If you don’t practice regular caution and restraint, you’re going to have a stubborn mess to clean up. And, if you do wind up with a stained carpet, you can’t simply use any old cleaner; you have to clean it the right way, or risk ruining it. On the bright side, your credit can be cleaned up, no matter what kind of mess you make (unlike white carpet, which can certainly reach a point where it can’t be saved). All it takes to clean up your credit is to identify the problems, lay out a sound plan, and tackle the issues one by one. Over time — and with some hard work — you can clean up even the most stubbornly stained bad credit. Just be patient and know that it won’t happen overnight.